Farm products are sold at the reception, where is also available material on the main resorts in the region. For customers is available a swimming pool 14 meters long and 6 wide, and 140 cm deep. It is possible to organise excursions (trekking and mountain bike) in the area and region and guided tours of the principle cities of art in Umbria. In our farm animals are reared poultry and is available to customers a summer vegetable garden. It's available a children's play area and, nearby, there are tennis courts, soccer fields and a riding school. 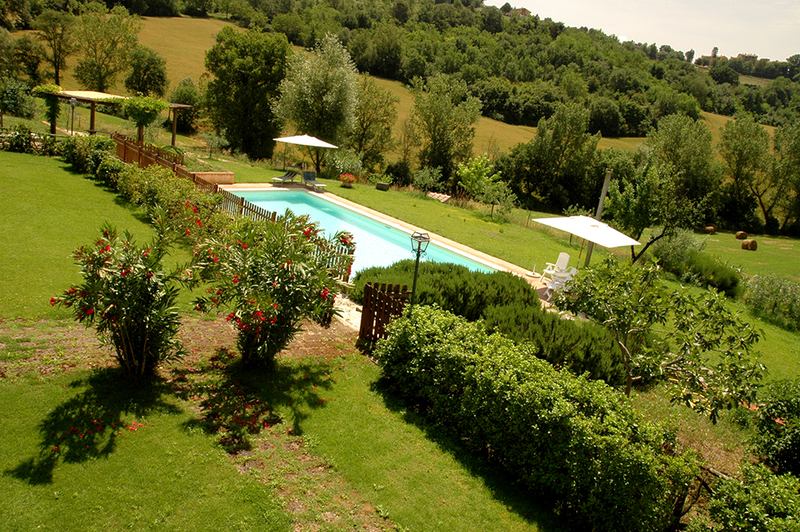 The Farmhouse has special agreements with different typical restaurants in the area, that also offer catering services. It is possible to receive daily supplies of food and drinks, and typical Umbrian products. 2 km from the agriturismo there's a supermarket "Checco Bazaar", where you can find regional products(meats, cheeses, vegetables, wine, cookies, etc. ...). Our customers are entitled to a 10% discount on all products.